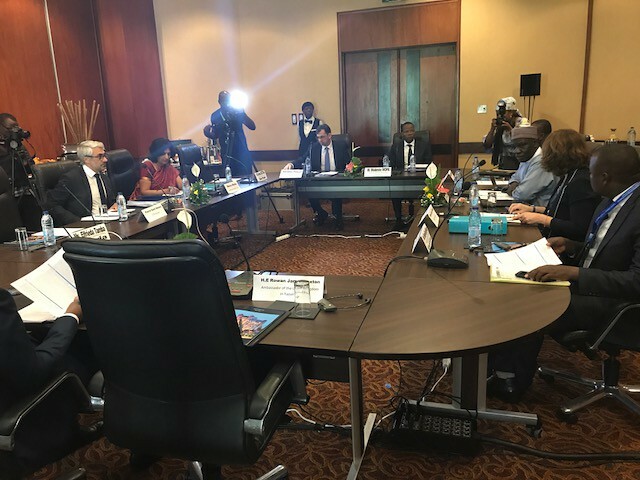 15/11/2017 – Today, in the margins of the 10th Global Forum meeting on Transparency and Exchange of Information for Tax Purposes held in Yaoundé, Cameroon Finance Minister Alamine Ousmane Mey, led a discussion with Ministers, high level representatives and officials from Africa on tax fraud and avoidance. They agreed on a call to tackle illicit financial flows through international tax cooperation. Recall the commitment of the Addis Ababa Action Agenda to redouble efforts to substantially reduce illicit financial flows by 2030 and affirm that sustainable development and good governance are among the seven African aspirations of the African Union Agenda 2063. Acknowledge that the report from the African Union and United Nations Economic Commission for Africa’s High Level Panel on Illicit Financial Flows from Africa has focused attention on the scale of the issue of illicit financial flows in Africa, which includes tax evasion and other criminal activities, and its negative impact on Africa’s development and governance agenda while also identifying ways in which to tackle it, in particular the exchange of tax information among countries. Emphasise the unprecedented efforts made by the international community to improve tax transparency and exchange of information which are a prerequisite for effectively tackling international tax evasion and addressing gaps and mismatches in tax rules that allow for artificial profit shifting. They have asked that these efforts are also carried out at the continental level under the auspices of the African Union with the support of all development partners and international and regional organisations. Taking this opportunity, France has committed to provide a substantial financial contribution for the new phase of the Africa initiative, which was renewed for three years, and will support African countries to fight illicit financial flows.